So.... continuing on the subject of camo addiction. Being the fashion dweeb that I am, I'm millions of light years late to the trend. Ah well..... at least I'm fashionably late. I've always been a little wary about the camo print. Overdo it and I'll appear ready for jungle warfare. All that's needed is some war paint to finish the look off. A couple of weeks ago, Kylie dragged me into a proper army surplus store stuffed with uniforms from all over Europe. Having perused an inordinate number of jackets, I've concluded that giants do exist. I'm 5'2 (and a quarter) and it's not as if I'm Thumbelina but it would've been so easy for me to disappear into one of the jackets and never to be found again. That and the ick factor of trying on something that may have been worn to war. D'oh! I know that's what camouflage clothes are for ....but I'm squeamish about things like that. After gazing at hundreds of photos online and getting pretty cross eyed in the process, I've concluded that camo print is 1) versatile. In fact, more so than I'd expected. 2) more palatable (for me, anyway) if it's in a more muted or darker tone. 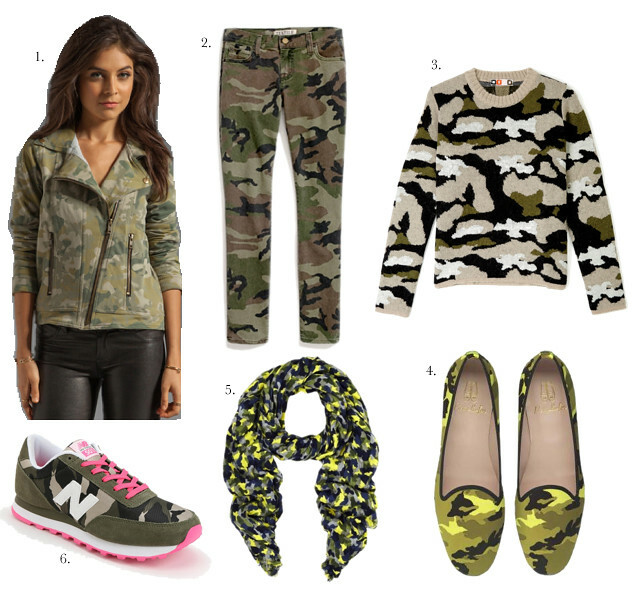 3) I will avoid slouchy oversized camo print pants at all costs. If you've already jumped on to this trend, how are you wearing yours? The camo dress is my favorite! So glad you posted all these pictures for inspiration (starts pining away). 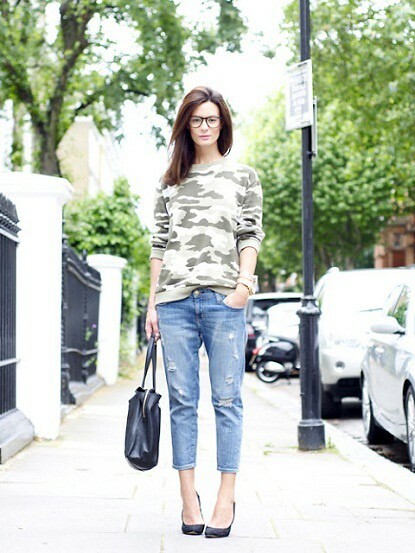 I'm waiting on a pair of camo trousers to come and I'm looking for lots of ways to style them! I'm fashionably late too. This is a great trend to follow. Love that whistles scarf!! 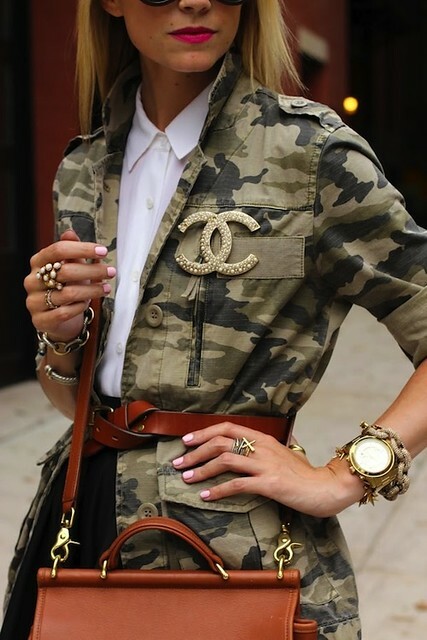 Need to get my hands on some camo trews pronto!! It took me forever to come around to this trend too. I prefer the more muted tones and love the dark blue pants you posted.